Counter steering or push steering is used by single-track vehicle operators, such as cyclists and motorcyclists, to initiate a turn toward a given direction by momentarily steering counter to the desired direction ("steer left to turn right"). To negotiate a turn successfully, the combined center of mass of the rider and the single-track vehicle must first be leaned in the direction of the turn, and steering briefly in the opposite direction causes that lean. Deliberate counter steering is essential for safe motorcycle riding. At the higher speeds that motorcycles commonly attain, it becomes increasingly impractical to steer by taking advantage of the minute and random corrections needed to maintain balance. 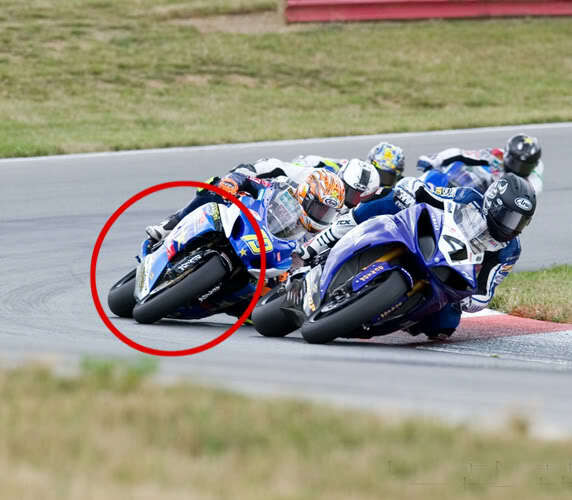 Much of the art of motorcycle cornering is learning how to effectively "push" the grips into corners and how to maintain proper lean angles through the turn. When the need for a quick swerve to one side suddenly arises in an emergency, it is essential to know, through prior practice, that the handlebars must be deliberately pressed away on that side instead of being pulled. Many accidents result when otherwise experienced riders who have never carefully developed this skill encounter an unexpected obstacle. Push steering is a push forward (or forward pressure) applied to your handlebars. This applies to all handlebars – sport bike, cruiser, ‘monkey bars’ - straight shortened, high or low. This technique does not apply to conventional multiple-tracked vehicles such as trikes or sidecar motorcycles. Push forward on your left handlebar to GO LEFT; push forward on your right handlebar to go RIGHT. This is the brain drill –push left go left, push right go right. Repeat it. It’s the type of push you give to a door to open it. And a good example is one of those revolving department store doors- you push forward. Nothing changes in speed, gear or removing your grip on the handlebars. As riders we are well aware of the fact that the turning of a motorcycle at ‘walking pace’ slow speeds is achieved by simply turning the handlebar in the direction we wish to go- the bicycle method we learned when we were first taught to ride. Many accidents result when otherwise experienced riders who have never carefully developed this skill encounter an unexpected obstacle. We know as we gain speed something called ‘gyroscopic inertia’ kicks in. This is characteristic as mentioned above of a single track vehicle. This is precisely why you have difficulty riding slow as you will feel the weight of the motorcycle. At higher speeds this inertia makes the motorcycle stand up yet it can make it challenging to turn. We need to interrupt this forward moving power to create a lean to turn be it to swerve around something or ride through a corner/turn. It’s this combined centre of mass (or centre of gravity) of rider and motorcycle that first be leaned in the direction of the turn. Push steering briefly in the opposite direction causes that interruption resulting in a lean. On that point we need to acknowledge the push power or “steering torque” and steering angle necessary to establish the lean required for a given turn from the sustained steer torque and steer angle necessary to maintain a constant radius and lean angle until it is time to exit the turn. The initial steer torque and steer angle are both opposite the desired turn direction. The sustained steer angle is usually in the same direction as the turn, but may remain opposite to the direction of the turn, especially at high speeds. The sustained steer torque required to maintain that steer angle is usually opposite the turn direction. The actual magnitude and orientation of both the sustained steer angle and sustained steer torque of a particular bike in a particular turn depend on forward speed, bike geometry, tyre properties, and combined bike and rider mass distribution.